The longer we homeschool, the harder it gets to answer the question, “What curriculum do you use?” Goodness! I use so many different things that it’s hard to offer a simple response. Even this blog post looks complicated when I list out everything we plan on doing. For Emma’s eighth grade year, I did a lot of shopping the shelves to see what we could use without buying many new materials. Fortunately I had quite a bit on hand. I did round it all out with an order from Rainbow Resource, Amazon, and CBD, but I kept my overall costs at a minimum. I found Heritage History to be a low-stress, no-frills, affordable history option last semester. Having an iPad is going to make reading the eBooks even easier than the Kindle, I think, since the screen is so much larger. Emma will continue using notebooking to narrate what she studies. I’m taking the easy way out this semester by using Barb’s carefully laid out plans for artist and composer study. I downloaded the PDF to my iPad and instantly realized how easy this is going to be. It comes complete with the art to study and some printables. For the music, I did need to purchase some CDs, but Harmony Fine Arts had clear lists of what to buy. The guide schedules all of the assignments so that I don’t have to spend a lot of time planning. See HFA for a PDF with grades 5-8 and the artists and composers covered for each year. The “grades” are somewhat arbitrary, of course, so we chose the artists that we were most interested in studying. Teaching Textbooks is working for Emma, so we are going forward with it. In fact, I feel confident that we will continue this material all the way through high school. I take a crazy pride in the fact that we’ve never used a science textbook, preferring to stick with living books only. I fear that my resolve will crumble when it comes to high school, though. Fortunately Apologia has some great options. I’m not sure where to fit these last two options into the academic areas, and really it doesn’t matter. (The beauty of homeschool!) I am eager for Emma to get some behind the scenes insight into how computers work with Homeschool Programming. And the logic curriculum is going to be perfect for her developing mind. Anyone else with an 8th grader this year? I’d love to hear how your curriculum choices compare with mine. Want more curriculum posts? Visit the Not Back to School Blog Hop sponsored by iHomeschool Network. And link up your own posts all this week. There are some special FREEBIES waiting for you there. Jimmie, I always look forward to reading about your homeschool curriculum choices….I’ll be stashing them away to use as my children grow up…..I love how you pick and choose so well for Sprite!!! Looks like a great year ahead! Are you still living in Asia? I was looking forward to reading your choices too Jimmie. Keilee is so close to Emma’s age. I love the fact that you have never used a Science textbook! That is awesome. I want so badly to purchase the Notebooking Pages Treasury Membership. You have gotten me so fired up about Notebooking! As soon as my job gets back going I am going to purchase that. Hoping you and Emma have a wonderful school year!! What an excellent line up Jimmie 🙂 If only my parents knew what homeschooling was when I was a kid….LOL. Have a wonderful year! That looks like a neat year ahead for Emma! We have loved Redwall and my 11 year old Makayla has read all the sequals she could get her hands on. The younger children enjoy listening to Redwall in audiobook format. I still need to make some solid plans for composer studies this year or it just won’t happen. I’m considering doing a year of just hymn studies instead. We’ll see what I finally figure out! I love reading what you are up too. We are both doing Wagner and Bizet this year. How cool! Our kids loved Pagoo! Have a wonderful year. While Sarah is technically in seventh grade this year, we’re working across multiple levels depending on the subject… and science, being one she’s a little more proficient in, looks a LOT for us this year like Emma’s year! We’re loving space and astronomy, and we’ve been following the progress of the Mars rover, Curiosity, that just landed this morning. Has Emma seen that? She might love it! LOL! I guess I have to get used to the idea that Sprite is all grown up, complete with a real name and everything! We read Pagoo as a family read aloud earlier this year, and it is an AMAZING book. Just amazing. The writing is excellent. Love hearing about your plans for each year. You are ahead of where we are grade-wise, so I always glean such helpful info. by seeing what you have tried and your thoughts about each thing you have tried. Thanks for making Notebooking so interesting and accessible too. We are getting more into notebooking this year and can’t wait! Thank you so very much for this post!! I just ordered Teaching Textbooks for Grade 7. It looks like a dream come true for our math needs!! God bless you!! I have never used Teaching Textbooks, but I know it is not a good curriculum for high school. I have friends who have used it during high school and did poorly on the SAT math. Teaching Textbooks is working great for us. It has created an interest in math that was previously lacking & now our days don’t end in tears!! I don’t believe in a cookie cutter one size fits all for anything! What works for one family doesn’t necessarily work for another as we all have different learning curves and styles. As for the SAT stories, I did poorly on the math section and have led a very FULL interesting life, complete with college, a husband, a family, and a career before I decided to become a stay at home homeschooling mom! I had always heard the praises of Saxon math, but we hated it! So, I think as with any curriculum choice, it is whatever works for your child. I’m glad I found you! 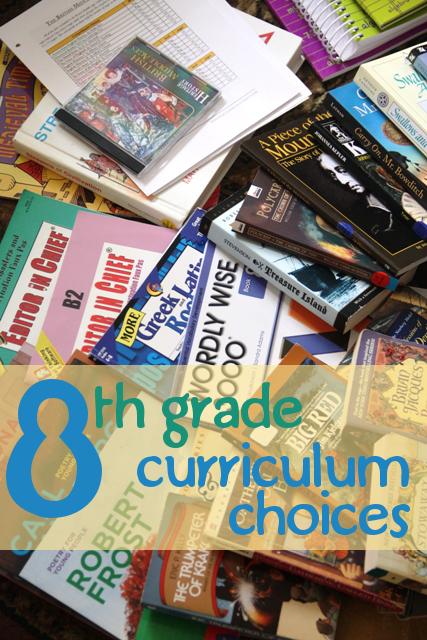 I just pinned down my daughter’s 7th grade but I am always looking for resources. Thanks!